“No disability or dictionary out there is capable of clearly defining who we are as a person.” I can relate to this thought very well. I am not promising you a flabbergasted experience, it is just an ordinary story of an ordinary person. Since my childhood, I was consume with the thought of how a girl can take over the world who couldn’t walk properly? Right from my childhood, I was treated differently, my friends came in pocket-size number. Yes I was different! I couldn’t run like others. Everyone was so busy watching my lacerated leg, nobody noticed my fathom wings ready to flutter and take over the sky. It is true that wings of transformation are born from struggle and patience, but it requires one more thing…hope! 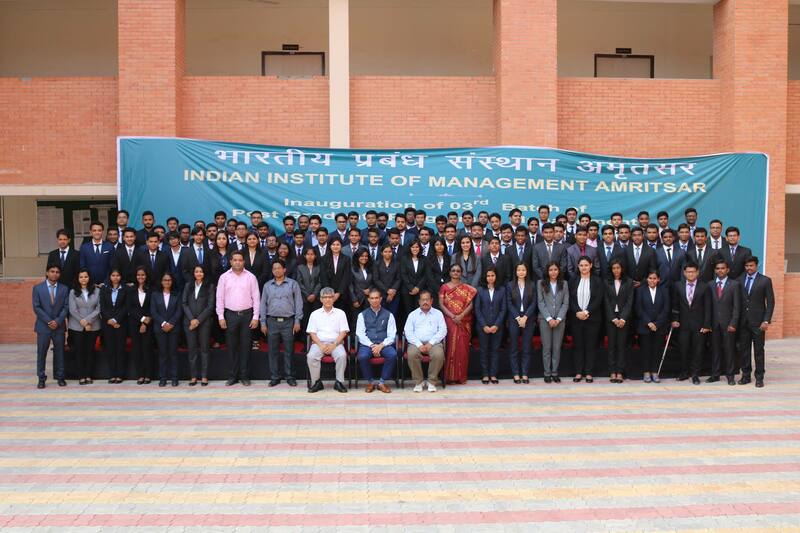 A hope to fly, from my childhood I always hoped for myself something good to happen in my life, at-last the day came when I converted IIM Amritsar into my hands and made everyone proud. Just like any other CAT aspirant converting into an IIM was a big deal for me. Thanks to Chetan Bhagat we all had our huge expectations. I was so excited to enter into one of the top institutes of the country. But then everything became shuddery when I joined a WhatsApp group. I checked out almost everyone, then I realised I am far behind from these people and I will never be able to catch up with them. I was timid and afraid as I had only bullying experience in the past. Also coming from proper Brahmin Marathi medium school with English as my third language made impuissance for me. I learned to write my name in English when I was in 6th class and I wrote a first complete sentence in 9th. I never thought about improving my communication skills because I never had any. When you have such kind of background, its terrifying to even think about adjusting with people with so much knowledge and wisdom. But somehow I managed to open my wings to measure the sky. My first day in Amritsar was really amazing. The seniors coordinated with us till we reached our rooms. Everyone was so congenial and humble, so much different than what I have pictured from my digital stalking. In the morning right at 7 o’clock, when I was nostalgic about Wada Paav, Amritsari Kulcha and Chole came to rescue me in breakfast. Suddenly, I got a call from girl who was supposed to be one of the my flatmates, I picked up her call and all I could hear is the shouting voice on the other side. I didn’t know what to do or say. I didn’t have any problem with her shouting on me for not leaving the key behind but the problem was that she was shouting all this in English. I remembered that she is from Tamil Nadu and she don’t know Hindi. And there it came back all the fear, anxiety and what not. I took a deep breath and I told myself, “Shreyasi you can do this!” then I confidently replied to her, “Sorry…key…forgot…me…in the room…come…now…me…here”. How did I do that, How do I meet a stranger and let all our fears out to them and then expect them to look straight back at us with a smile on their faces and a look that they understand, understand from where we are coming, what struggles we managed to survive, without trying to guess where we are going forward. And then those strangers become the best part of your life, listening to your stories, all the laughs together, to wipe the tears of each other and then hiding them inside and letting us know that we are fine. Then we went to the college for inauguration ceremony, everything was so well organized that nobody could tell that this is a student-driven institute. To mingle up with people from almost 24 states all over the country is quite a task and thought provoking. It was a mesmerizing experience to meet people from different states, with different culture, different languages, different food habits (which is the most important part). The diversity is not restricted to only geographic but we have Engineers to Doctors here, from entrepreneurs to an English honors and CA to Political background, we have diverse set of educated people from all domain. I have never seen such a diverse mix of people and I was so excited that these are the people whom I’ll be sharing this journey with. I was so worried about not knowing one language but now, right from “Periya paruppu” to “ Mach khabo” I know everything. During our induction program we got to know about all the committees and there was one committee I resonated with; “The Cultural committee”. The kind of energy and funkiness they brought to the table was really unparalleled. There was something about them. As I had done theater before, I really wanted to join this committee. When we had our Culcom induction (Aagaz) I realized that I am surrounded by so many talented people. We had singers, guitarists, writers, actors, a photographer who is a writer, comedians and many more . Culcom provides these people a proper platform to showcase their talent. There was a “3AM dance and drama club” for all those bathroom dancers and drama queens to come out of their comfort zone and be the performer. When I elected myself for Culcom, I got plenty of votes and I became one of the coordinators (being an extrovert sometimes pays off). And from there it all started; organizing the events, making sure that people are turning up for the events, checking the feasibility and communicating everything to the management. Be it freshers\farewell, musical bonfire nights or festivals like Holi, Diwali, Ganesh Chaturthi, Durga Puja, Onam, Lohri; Culcom has cherished all the cultures possible. Culcom taught me that you don’t need a book to be street smart, it’s the actual hand on experience which helps you. Photography is something which I do to unleash the art in me, The lights and composition is the thing which reflects inner me into my photographs. Though it is just a hobby for me. You don’t need any professional DSLR or high end camera to follow your passion. All I need is my eyes and perspective to reflect it in my photographs. In IIM Amritsar I came across with some talented people from the photography club (50mm). 50mm photography club covers all the events happening in the institute and makes sure that the institute has a good digital presence. I believe that Photographers are the most underrated people in any event but their skills are something that we couldn’t look pass. I started learning new things from them and before I knew I became an active member of 50mm. The most important thing I learned through 50mm is to deliver your perspective and showcase the different standpoint of our celebrations, joy, humor and emotions. Where all these things were going so well, account courses were something which was not. Being an engineering fresher all journal and ledger were French and Spanish to me. But lucky for us we had a CA to our rescue and that’s when I learned what they call a peer learning. We had a CA for accounts, economics graduate for economics courses, operations guy for operation management courses. They always taught us the basic concepts just to ensure that other students weaker in other subjects gets the basic idea from peer learning. It is very normal to lead a bunch of people but it’s difficult to be a team player and take everybody with you. I am not a bit of traveler as my leg is incapacitate for long walks. I too wanted to explore the outer world as I’ve never been to other cities like my friends did. I too wanted to roam like a free bird. When you have friends with whom you can vouch on for long travel you can make it to one of the perilous place like Spiti Valley. The place with highest altitude with extreme whether conditions. I’ve never imagined that I could make it to the highest village ever connected with motorable road. IIM life has given me backbone to travel solo and made me confident enough to travel the way you want, as absurdly, as seriously. You’re allowed to sit quietly in a corner and not interact with anyone, you are allowed to watch golden sundown with just peace and making soul pristine. It has given me something that no professor can teach, no friend can linger, no love can savour. The one thing I was skeptical about was the faculties but despite of being one of the new IIMs we had great visiting faculties among top business schools of the country. Quantitative Method, Business Law, Macroeconomics, Human Resource Management, Strategic Management these are few of the best subjects taught by the best faculties ever. No matter how low self-esteem you have or how less confident you are on the stage IIM will bring the best out of you. Because there was a time, when we lived beyond the fear, which now holds us back and so there was a time, when we didn’t require to colour everything around us just to make it look appealing, but we revelled in the grey and smiled in the colors, and we did everything our heart asked us to. A light in the dark is all we need to keep going! You had your dark times … And this story of how you honed your skills and brightened your inner light to shine with inspiring warmth around it! this is awesome..!!! very well conveyed. Wish you all the happiness Shreyasi ! Hey shreyasi, you have an inner strength that transcends everything else. Never give up on yourself, you are not different you belong. And Congratulations on the glorious achievement of getting into IIM Amritsar. You are miles ahead, because you have the the conviction. Complete self-reliance takes time as all of us are learning now. It is only when people like you write that we realize how the institute has helped us all grow. An inspiring journey nicely pictured!